For those who are not able to attend the Track and Fitness Center at the DAC Open House on Friday, April 26, 2019, you may apply for membership with Brenda Moran in the elementary school between 7:30 am and 4:30 p.m. beginning Monday, April 29. Memberships take at least 24 – 48 hours to activate. You will be notified via e-mail when your application is complete and your access card is available for pick-up. Please contact us at fitness@dansville.org with any questions. Please take notice that there will be a regular meeting of the Reproductive Health Committee of Dansville Schools, Dansville, Michigan. 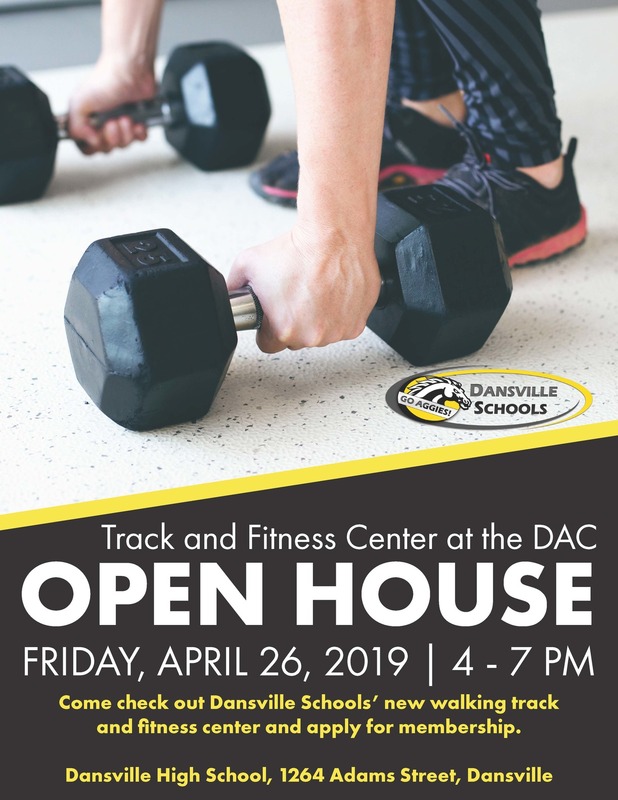 Please join Dansville Schools from 4 - 7 on Friday, April 26 for an open house featuring the Track and Fitness Center at the Dansville Athletic Center (DAC). Come check out the new walking track and fitness center and apply for membership. We are very excited to announce that the facilities will be opening on Monday, April 29 to registered members. 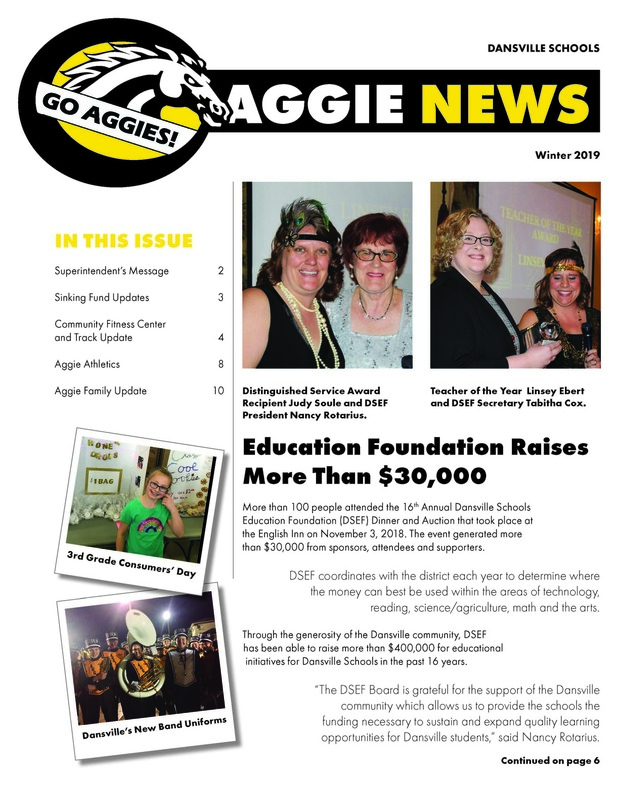 Check out the latest issue of the Aggie News! 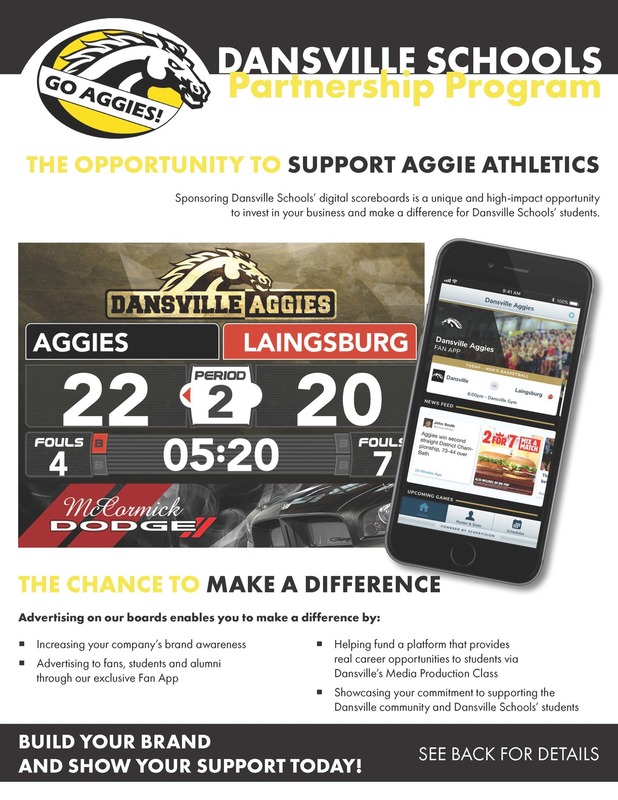 Sponsoring Dansville Schools’ digital scoreboards is a unique and high-impact opportunity to invest in your business and make a difference for Dansville Schools’ students. Please contact Becky Ames at 517-623-6120, Ext. 3416 or amesb@dansville.org for more information. Dansville is a rural community conveniently located within 15 minutes of most commuter destinations in southeastern Michigan. Its economy is supported small business, agriculture research and production. The Dansville community is school and family-centered, offering a high level of support from parents and citizens for the school and its efforts. The K-12 school system offers the best of small and large school settings, in that each student is known personally by the staff while being exposed to a wide variety of educational opportunities, including wide participation in AP and dual enrollment courses as well as attendance at the Wilson Talent Center. The mission of Dansville Schools is to inspire creativity, confidence, compassion, and hope in all students. Our students will demonstrate knowledge, critical thinking, communication skills, and collaboration as world-changing members of the Aggie Family. Call or Text Our Anonymous Tip Line at 567-694-5182 to report bullying or any suspected fraud. Tips can be submitted to this line 24/7 by phone, text, email, app or via the web-based form at http://www.mi.gov/ok2say. You may report planned school attacks, weapons, assault, bullying/cyberbullying, threats and more. Tips will be forwarded to the appropriate school, local and/or state agencies. In the event of severe weather, Dansville Schools will follow the safety procedures outlined in our Crisis Communication Plan and work with local emergency personnel to ensure the safety of all students and staff.